Each one of us has experienced stress at one point or the other. Stress is the emotional and physical strain caused by our response to pressure from the outside world. It is the feeling that is created when we react to particular events in a particular way. It's the body's way of rising to a challenge and preparing to meet a tough situation with focus, strength and heightened alertness. It's almost impossible to live without some stress. Stress in itself and in the proper amounts is not bad. But if stress gets out of control, it may harm your health, your relationships, and your enjoyment of life. Identify The Cause - To tackle the problem, it is very important to know the cause. Only then will you be able make the necessary changes or adjustments. If you're unable to locate the cause of stress easily, keep a small stress diary around. Makes notes in it, of the times you feel stressed and the event preceding it or the events before which you feel the stress build up. Look at how you currently cope with stress - Think about the ways you currently manage and cope with stress in your life. Your stress diary can help you identify them. Are your coping strategies healthy or unhealthy, helpful or unproductive? Unfortunately, many people cope with stress in ways that compound the problem. Learning healthier ways to manage stress - If your methods of coping with stress aren't contributing to your greater emotional and physical health, it's time to find healthier ones. There are many healthy ways to manage and cope with stress, but they all require change. Changing your perception - It is said that it is not the event but the perception of that event that affects us the most. Every coin has two faces and you choose which face you want to see. An optimistic outlook towards the world, events and people around you will help you manage stress in a better fashion. skills that must be developed to reduce stress. It just seems that all of us have too much work and too little of time. But the fact is all of us have the same number of hours in a day, and no amount of effort can change that. What we can influence is how we spend those hours. . Plan your days and prioritize your time to get the most out of the time you have. Make time for fun and relaxation - Beyond a take-charge approach and a positive attitude, you can reduce stress in your life by nurturing yourself. If you regularly make time for fun and relaxation, you'll be in a better place to handle life's stressors when they inevitably come. • Set aside relaxation time. Include rest and relaxation in your daily schedule. Don't allow other obligations to encroach. This is your time to take a break from all responsibilities and recharge your batteries. • Do something you enjoy every day. Make time for leisure activities that bring you joy, whether it be stargazing, playing the piano, going for a walk or reading a book. • Keep your sense of humor. This includes the ability to laugh at yourself. The act of laughing helps your body fight stress in a number of ways. 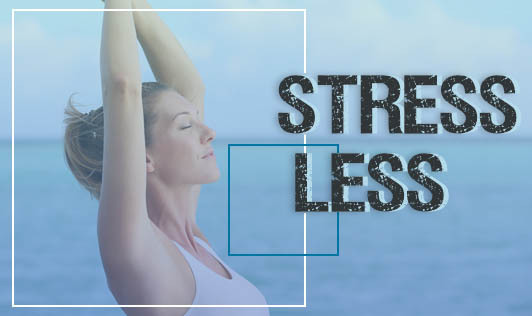 resistance to stress by strengthening your physical health. • Reduce caffeine and sugar. The temporary "highs" caffeine and sugar provide often end in with a crash in mood and energy. By reducing the amount of coffee, soft drinks, chocolate, and sugar snacks in your diet, you'll feel more relaxed and you'll sleep better. • Avoid alcohol, cigarettes, and drugs. Self-medicating with alcohol or drugs may provide an easy escape from stress, but the relief is only temporary. Don't avoid or mask the issue at hand; deal with problems head on and with a clear mind. Stress Is Not Permanent - Knowing that stress is not permanent will help you in tackling the problem effectively. Remind yourself that stress can be controlled and look at the positive side of things. Relax when you feel stressed and try to look for a solution with a calm mind and not let your emotions dictate when you look out for a solution to your problem. Find And Use Your Relaxation Response Effectively - Relaxation response is something that can help bring down your stress level. It can be a word or an act. The key is to repeat the word or action and get any other thoughts away from your mind. Take a minute of yourself and move to a quiet place and use your relaxation response. Focusing your mind on prayer or using a stress buster ball are some of the examples of relaxation response techniques. You could practice deep breathing. You can trick your body into relaxing by using deep breathing. Breathe in slowly for a count of 7 then breathe out for a count of 11. Repeat the 7-11 breathing until your heart rate slows down, your sweaty palms dry off and things start to feel more normal. If you do change your attitude towards fighting stress and develop a relaxed approach, you will be able to handle things better. These tips can only be useful if you do have the will power to take control of your life. Eventually, the choice of letting stress dictate your life or improving your life by changing your attitude is in your own hands.